If you are considering lake homes for sale in Texas, take a look at Lake Bob Sandlin. Located along the Big Cypress Creek, only 5 miles southwest of Mount Pleasant, Lake Bob Sandlin serves local communities by offering some of the finest fishing and recreation in all of East Texas’s Piney Woods region. As president of Titus County’s Fresh Water Supply District No. 1, Bob Sandlin spearheaded the development of the Fort Sherman Dam, paving the way for the outdoor destination ...Learn more here! 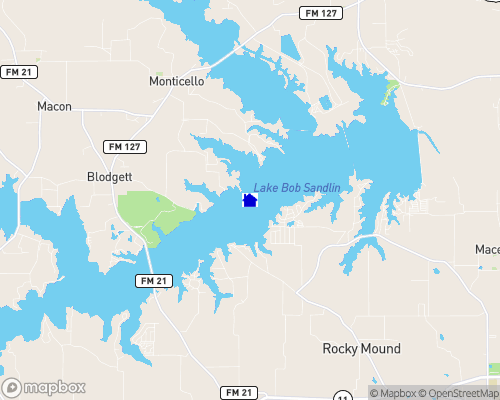 If you’re considering lake homes for sale in Texas, take a look at Lake Bob Sandlin. Located along the Big Cypress Creek, only 5 miles southwest of Mount Pleasant, Lake Bob Sandlin serves local communities by offering some of the finest fishing and recreation in all of East Texas’s Piney Woods region. As president of Titus County’s Fresh Water Supply District No. 1, Bob Sandlin spearheaded the development of the Fort Sherman Dam, paving the way for the outdoor destination the lake is today. Mr. Sandlin’s leadership not only provided clean drinking water to local communities in Franklin, Camp, and Titus Counties, but it also accounted for the enjoyment of area anglers, who continue to look to Lake Bob Sandlin’s waters to satisfy their craving for a good hunt! Bass fishing is the sport of choice in these parts, as white, spotted, and largemouth bass rule the lake. You’ll also find healthy populations of crappie, catfish, bluegill, and redear sunfish roaming the deeps. The natural habitat found in underwater vegetation and felled timber has especially supported the growth of white bass and catfish. Both varieties of fish have thrived in recent years, and the crappie are beginning to catch up in size and numbers. Lake Bob Sandlin boasts an impressive 9,460 acres of surface water for you to enjoy. Lake properties for sale near the shoreline are nestled in areas of thick forestry, complete with a number of public access points, boat ramps, and marinas. Launch your rented or personal power boat, pontoon, jet ski, kayak, or canoe and make some waves. It’s easy to pick up speed on the open water, and it’s a treat to navigate the secluded bays and coves that line the lake’s edge. And don’t overlook the always-enticing option of simply swimming or dreaming the day away—there’s plenty of public and sheltered beaches to claim as your own. The Lake Bob Sandlin State Park spans 640 acres and offers opportunities for recreation fun out of the water. Lakefront properties are situated around 75 miles of shoreline, placing them within convenient reach of the park’s many hiking, skating, and cycling trails, among other accommodations. Similarly, the Titus County Fresh Water Supply District Park can suit your recreation and water sports needs. And if you’re hungry for a good game of golf, head to area courses like Cypress Creek, Mount Pleasant, and Shadow Lakes. If you’d like to live on a Lake Bob Sandlin area golf course, visit GolfHomes.com for property listings and details. Lake Bob Sandlin was built on Big Cypress Bayou in 1977 and covers some 9,460 acres. It is adjacent, to Lake Cypress Springs and Lake Monticello. Bob Sandlin is recognized as a top fishing lake. Lake Bob Sandlin State Park is located on the lake and includes camping, swimming, hiking and fishing amenities. If you're into water sports....this lake is big enough for all your adventures. Nearby towns are Pittsburg, Mt. Pleasant and Winnsboro. Depth of Lake: 57 ft. Nearby cities: Pittsburg, 10 min, Mt. Pleasant 15 min., Winnsboro 20 min.